Just sprinkling some Guatemalan Christmas spirit in your life. With Christmas right around the corner, it made sense to give insight into non-American Christmas traditions. My beautiful mother hails from the small country of Guatemala, located in Central America. As a result, many of the traditions that she grew up with during this time of year were integrated into my upbringing. Having these traditions made Christmas more meaningful rather than being another Hallmark holiday; as I get older, I appreciate the meaning of Christmas and family more and more. Having the ability to connect with my Guatemalan roots enables me to appreciate the sacrifices my mother made in coming to the United States even more. 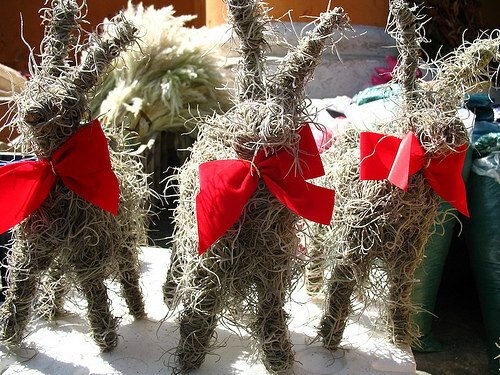 The following list comprises traditions that many people across Guatemala follow as Christmas approaches. 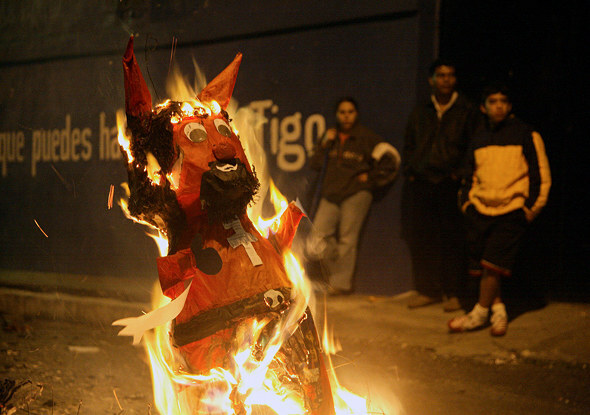 "El quema del diablo," or "the burning of the devil," occurs every December 7th. Piñatas designed to be the devil are burned as a symbol of releasing any negative energy or letting go of any bad things (events, thoughts, etc.) from the past year. It is a cleansing of the soul and of the home, in order to prepare for the new year. 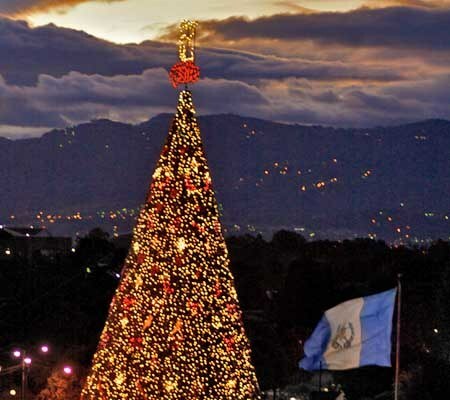 This activity marks the official beginning of all Christmas activities in Guatemala. Also taking place on December 7th is the procession of the Immaculate Conception; it occurs after the burning of the devil. This tradition consists of a large statue of the Virgin Mary on a beautifully decorated wooden float. The float, usually carried by six to eight people, or in some cases, non-wooden floats pulled by a vehicle, is carried around the specific town for everyone to see and admire. People follow the statue and sing songs dedicated to Mary. The procession ends when the Virgin is brought back to the church; the procession is then followed by a mass in her honor. On December 12th, the Virgin of Guadalupe is celebrated. Many Guatemalan children wear traditional Indigenous clothing and do a procession with sparklers and other pyrotechnics in the honor of the Lady of Guadalupe. Many parents also bring their newborns to see the Virgin in order to present their children and ask for her blessing and support. Like many other Latin countries, Guatemala celebrates Las Posadas from December 16th to the 24th. The nine nights symbolize the nine months that Mary was pregnant with the Christ Child. 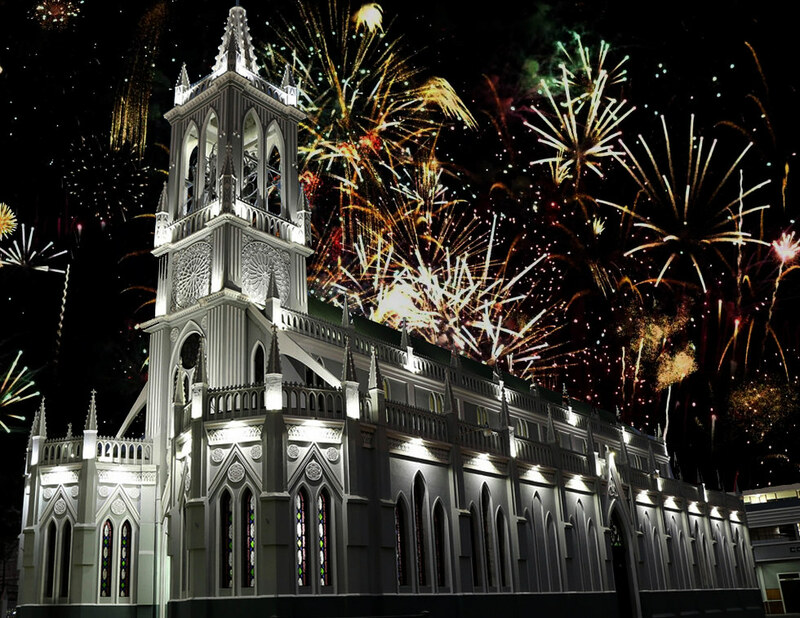 Each night, a wooden float with the statues of Mary and Joseph is carried to three different houses (each house is chosen in advance); the first night of the procession begins in the church. The carrying of the float symbolizes the journey that Mary and Joseph made from Nazareth to Bethlehem. At the first two houses, a part of the group in the procession enters the house and performs a dialogue; those carrying the float are denied entrance, symbolizing those who turned away Mary and Joseph. At the third house, Mary and Joseph are allowed to enter and are placed in a designated area, generally by the Nativity scene; the hosts also greet those in the procession with food and beverages. The images of Christ's parents remain in the host house until the following night, when the procession begins again. On the last night, the statue of baby Jesus is added when they reach the last house. Literally translating to "Mass of the Rooster," but really meaning a midnight mass, this service takes place on Christmas Eve and is preceded by a procession (yes, another one). The procession consists of the wooden float of the Holy Family; the float is picked up from the house of the last host of Las Posadas, and is carried into the Church at 11 p.m. The mass begins as soon as the float is set down and admired, and ends at midnight. At midnight, attendees of the mass hug each other, and then members of the community go around and visit neighbors to greet them and celebrate the birth of Jesus. Just like different countries around the world, Guatemalans adorn their houses. However, where the United States loves their inflatable reindeers or Santa Claus, a majority of Guatemalans don't have front lawns for that. Rather, they stick to the lights, tinsel (loads of it), lambs made from Spanish moss, and pine needles.Pine needles create the Christmas aroma that is associated with North American Christmas (a.k.a. the pine trees). Some homes even have fake trees to decorate with lights and ornaments; these trees are generally a lot smaller than the ones we are used to. From hand-held sparklers (known as estrellitas, or "little stars"), to firecrackers that kids can light, to full out fireworks, pyrotechnics are a big part of Christmas. They are part of various processions, with the kids lighting them. On midnight Christmas morning, many people light fireworks, or firecrackers to celebrate the birth of Jesus. One of my fondest memories of spending Christmas in Guatemala with family was that specific morning. My aunt had bought a variety of pyrotechnics for my sister, my cousin, and me, and as soon as we left the mass, we were lighting them up in front of my grandmother's house, in the street. One of the easier ones, aside from the sparklers, was this little ball-like one. We had to throw it down hard on the ground and it would make a popping sound as little bright lights exploded. Honestly, one of the best parts of Christmas time is the food. Tostadas (a.k.a fried tortillas with toppings) and Horchata are served during Las Posadas and after every mass. 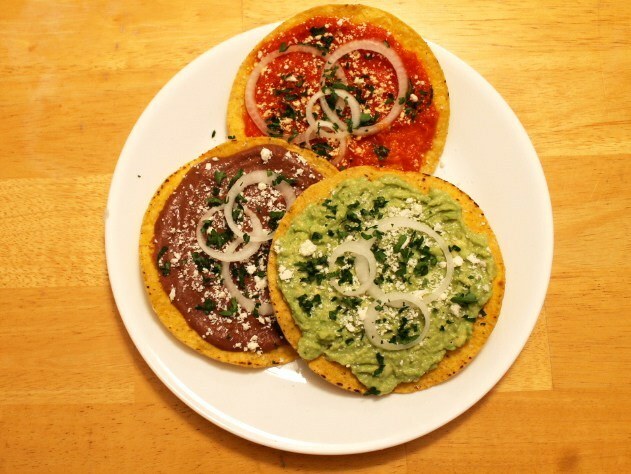 There are three types of tostadas: refried beans with queso seco, some onions, and cilantro; guacamole (with lime juice, and some salt) with onions and cilantro; and red sauce (tomatoes, garlic, onions, sweet pepper) with onions, queso seco, and cilantro. Aside from that, you got tamales and chuchitos (smaller versions of tamales) made with chicken or pork on the inside. Carne Mechada which is either pork or beef. Carne Mechada takes two days to make (but its worth it), because you have to marinate the meat. Served over white rice with fresh hand-made tortillas, carne mechada is my favorite dish. And finally, el ponche (made from papayas, apples, sweet plantains, pineapples, various dried fruits, some cinnamon, and some cloves), or the "fruit punch" is served hot throughout the Christmas season. This traditional drink generally has Rum Zacapa, which is Guatemala's national rum, but is omitted from the list of ingredients if there is only one batch and underage kids are also enjoying it. The Nativity Scene is the central piece of Christmas decorations in Guatemala. 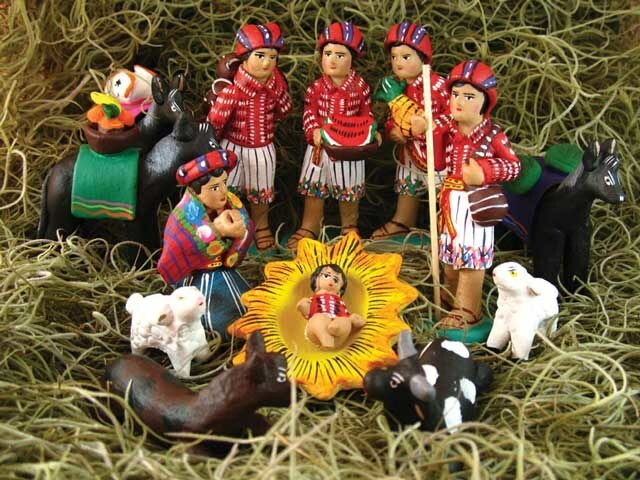 From sets that are small but vibrant with colors, to sets that come with clothing, el Nacimiento is a part of Christmas that Guatemalans place importance on. 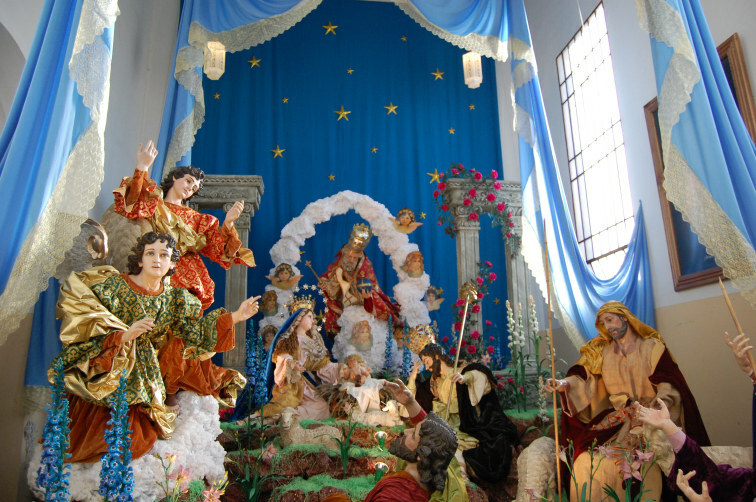 Contrast to American traditions where the baby Jesus is placed with the Nativity scene as soon as it is set up, Guatemalans do not place the baby Jesus when setting it up. Why? Because Jesus is not born until the 25th; it would not make sense to have the baby in the scene before his birthdate. For those who do not attend La Misa del Gallo, the family says a prayer around the Nativity scene at midnight. After the prayer, the baby Jesus is presented to either the youngest member of the family or the oldest member of the family. The designated person then lays the baby Jesus in the manger. It is not until either noon Christmas day or New Year's Day, that the baby Jesus is placed in the arms of Mary, that is if she can hold the baby. The day the baby is placed in Mary's arms is up to the family. In mine, we place the baby at midday on Christmas. If the Nativity Scene dolls are big enough, the baby Jesus is formally dressed in a white gown on New Year's Day. Another tradition with the Nativity Scene is that it does not get put away until February 3rd, after the celebration of the La Candelaria, or Feast of the Presentation of Our Lord Jesus. Guatemalans, unlike many Americans, have the tradition of opening a few – or all of – presents after the midnight prayer around the Nativity Scene, or after mass. While my family has never been big on so many presents, my sisters and I each choose one of the few presents we got and open it. It allows for some of the excitement of the opening of presents to die down a little bit. It is a reward for helping out during the Christmas season, and for thanking God for what we have. With all the events leading up to the birthday of Jesus Christ, Christmas Day is a day to relax. In contrast to many non-Latino countries, Guatemalans do not get up early on Christmas Day. It is a day to sleep in and enjoy the company of your family. There is no big Christmas dinner- that was last night (most likely with some carne mechada and ponche). 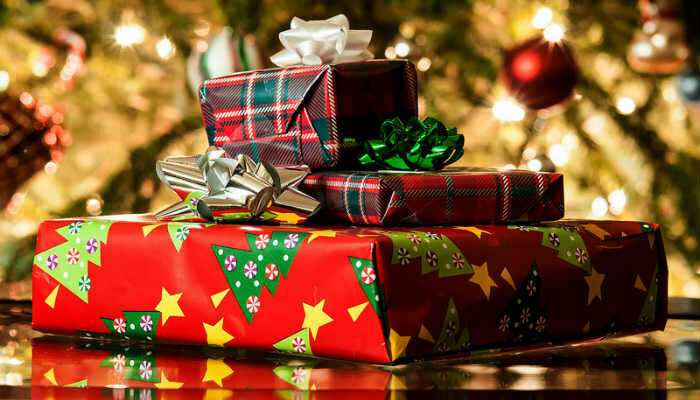 If not every present was open after the midnight mass or prayer, once everyone in the house is up, the rest of the presents are unwrapped. Otherwise, it is a very mellow day.